This entry is something a little different. My father always loved science fiction. He still does, but the events I'm going to relate occurred in the past, so I'm going to use the past tense here. When I was about 6 or 7 years old I was fascinated by a catty-corner bookshelf in our house that was packed with paperback books. Made of reddish-brown wood and mirrored in the back (so the books looked like double rows on each shelf), it stood three or four-tiered in the corner of a cluttered "music room" containing an upright piano and nearly the entire published output of the G. Schirmer Inc., Music Company, then one of the best known publishers of classical music books, and a room my brothers and I all learned and studied the piano under our father's tutelage. 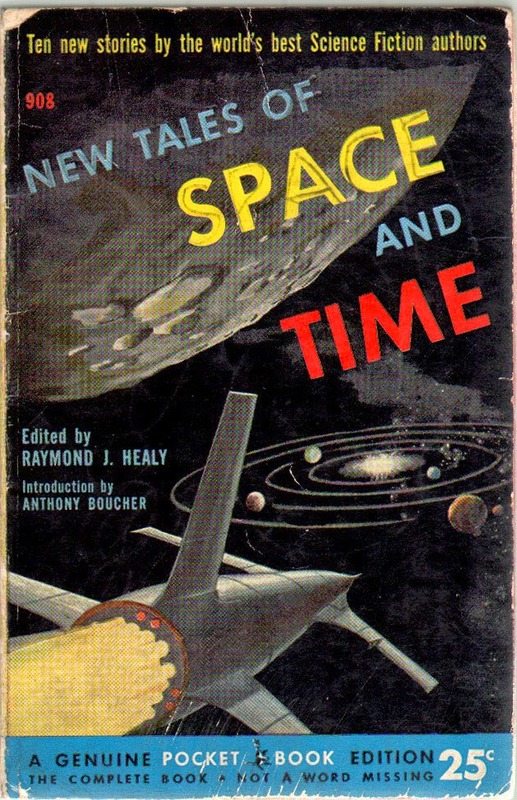 90% of the books were anthology compilations as my dad preferred them to longer sci-fi novels, finding it easier to get a complete story read in the down time he had. His favorite authors, hands down, were H.P. 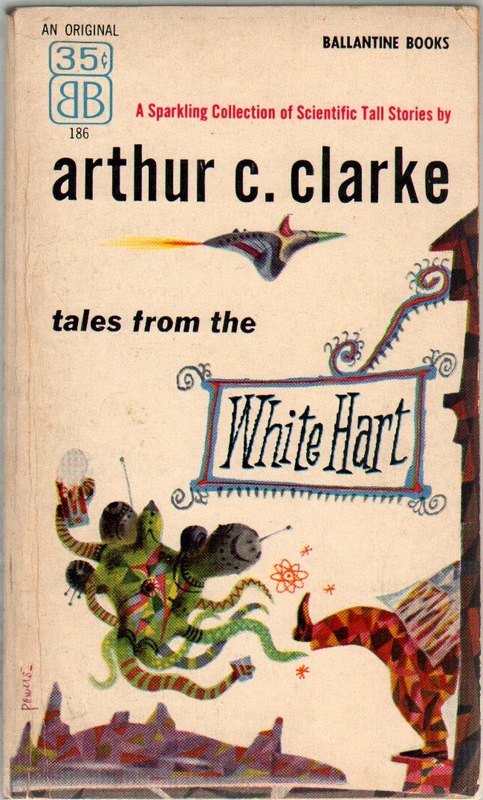 Lovecraft and Arthur C. Clarke. Now at that age I really couldn't read them and there were no pictures inside, except for one book by Ray Bradbury (with a gorgeous Frank Frazetta cover!) that did indeed have comic book type pictures of the stories (advertised as such on the cover, they were actually old E.C. Comics reprints). In the evenings, when my brothers and I went to bed, our father would often tell us stories in the dark, as any parent would do to his young children. Once in a while the stories were read out of a book with a flashlight, although most were seemingly made up on the spot, or as I later found out, many weren't. 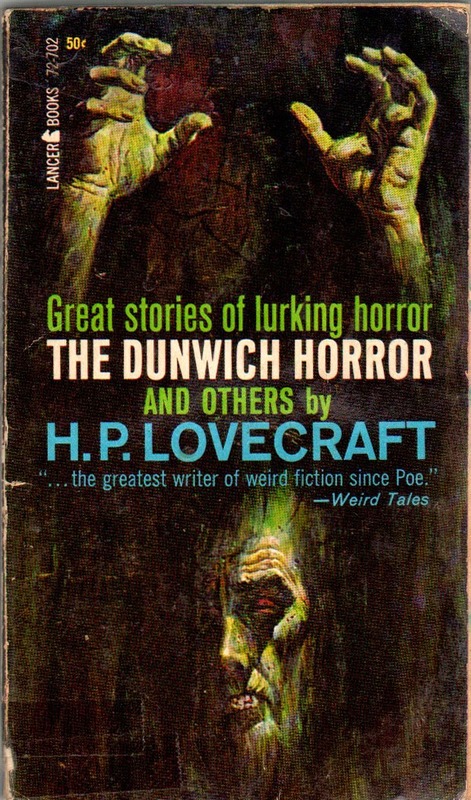 But the stories were often quite frightening and I'm certain I wasn't the only one who found sleep difficult after hearing stories called "The Peabody Heritage", "The Whistling Room", "Exile of the Eons" or "The Haunter of the Dark". Yes, I would daresay that some of those stories scared the wits out of us as my father set an incredible mood in the pitch blackness, with the consequence that often my mother would poke her head in and yell at him for frightening us.To be fair, he also told or read us stories by Sir Arthur Conan Doyle, including stories of Sherlock Holmes, The White Company, and the adventures of Sir Nigel. But there was one additional book on that shelf that was not a paperback book. It was a hardcover, battered and well-read, with some pages even starting to come loose. 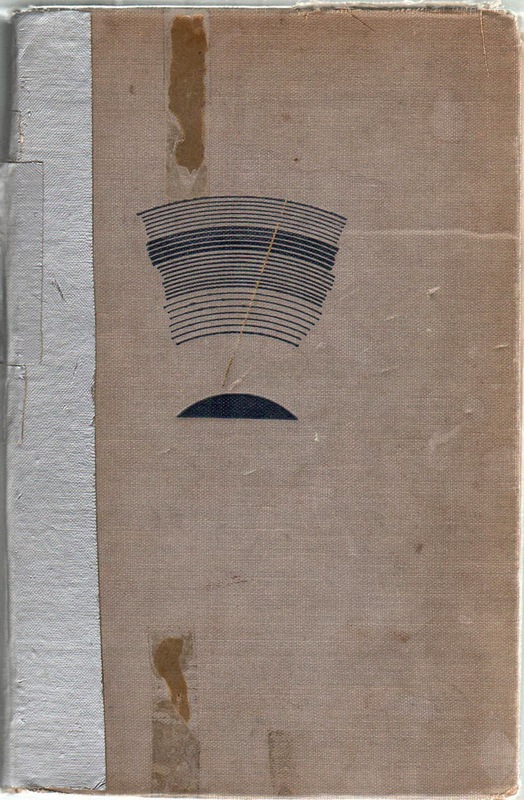 The book was plain steel-grey in color and the entire spine was bound in grey duct tape for reinforcement. It stuck out like a sore thumb, on the left-hand corner of the top tier (where it fit because the top was open), propping up the books next to it .There was no colorful picture on the cover (only a strange blue design) and the publisher was Random House, with the year of publication 1946, literally a century ago to a 7 year old. 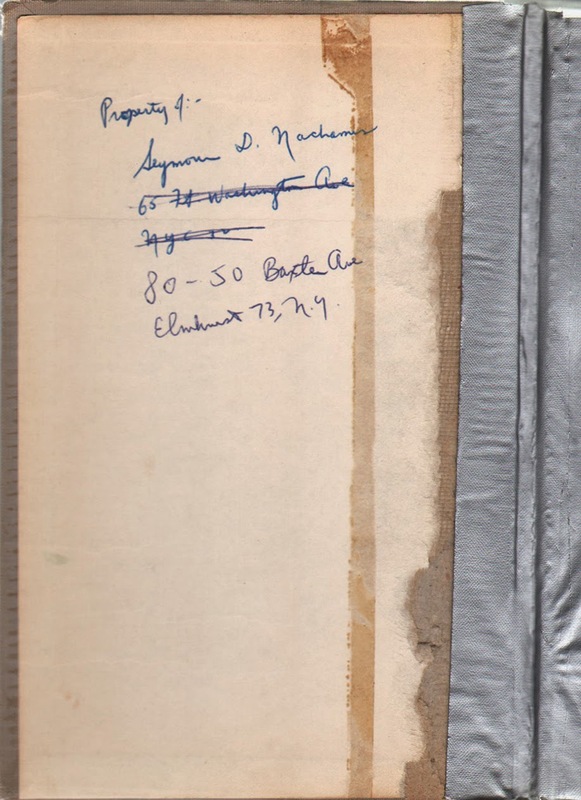 Inside was written in fountain pen ink, the name of the original owner, Seymour D. Nachamis, with several different addresses written on the inside front cover, each scratched out as he moved from Fort Washington Avenue in Washington Heights to Baxter Avenue in Elmhurst (and later to Continental Avenue in Forest Hills). Seymour was known to our family as Nick Nack, a jazz aficionado friend of my father who frequented jazz clubs in the 1940's through the 1960's, and was somewhat well known as a clubber by jazz musicians of the time in New York, including, Billy Taylor, Mary Lou Williams and Marion McPartland, at venues including The Hickory House on 52nd Street (where my father also played in 1962). During the second world war, Nick Nack served under Captain Ronald Reagan in Culver City, California, and over the decades, although my dad and Nick Nack's meetings in person were infrequent, they spent hours and hours on the phone discussing jazz, musicians, classic noir films and the latest jokes they'd heard. Inside front cover original owner's signature and addresses: "Nick Nack Copy"
Nick Nack must have given or loaned the book to my father. There was no title on the cover, instead that weird little blue graphic that made no sense to me. The title was also on the spine and visible by virtue of a window of gray duct tape cut out. In fact, I guarantee it was my father who duct-taped the book together, probably frustrated that the book given/loaned to him was literally falling apart. Archival? No, but the book is still together as can be seen. 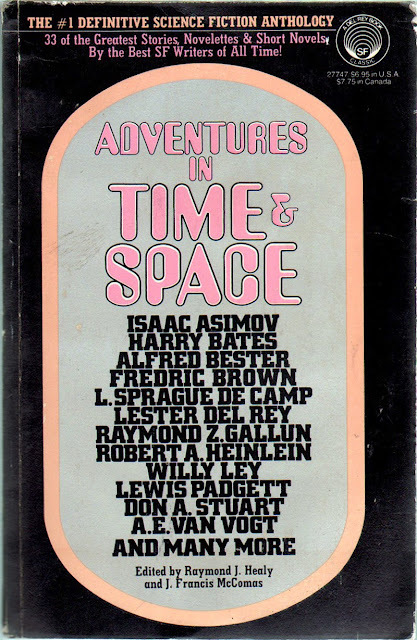 Inside I found the title, Adventures in Time and Space: An Anthology of Modern Science Fiction Stories. The book was massive, nearly 1000 pages and filled with 35 stories, some with authors I recognized from the paperback books. The volume was beat up, sparse and enigmatic to me. 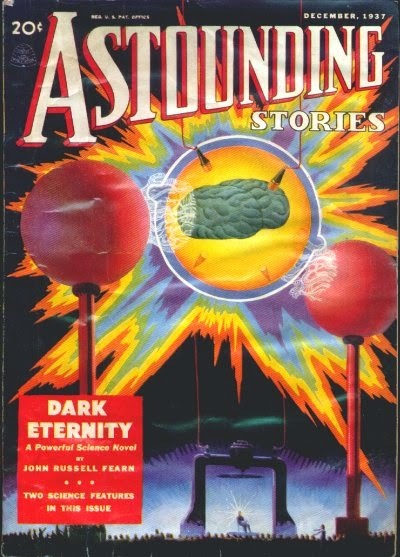 What intrigued me further was that every story in this book had been published even longer ago, in a strange sounding magazine called Astounding Stories, in the 1930's and 1940's (actually, from 1937 to 1945). What was this magazine? 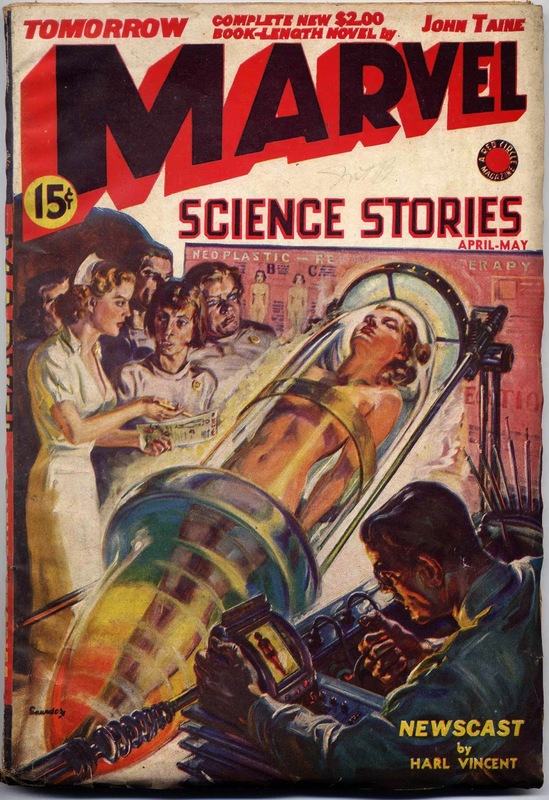 I had no idea but the question and the intrigue helped lead me to a lifelong journey and fascination into pulp and science fiction history over the long years. I also wanted to get a better copy of this book. The duct-taped battered "Nick Nack" copy was fine from a nostalgic family sense, but I wanted a copy that came closer to what it was like when it was originally published. A little research turned up the fact that the book originally possessed a dust jacket and also had several printings. The author line-up is science fiction royalty, the stories some of the most respected of the genre. At least two of the above were later turned into films, Harry Bates' Farewell To The Master was the basis for the classic The Day The Earth Stood Still in 1951, while John W. Campbell's (writing as Don A.Stuart) Who Goes There? gave rise to a less stellar The Thing From Another World also in 1951. 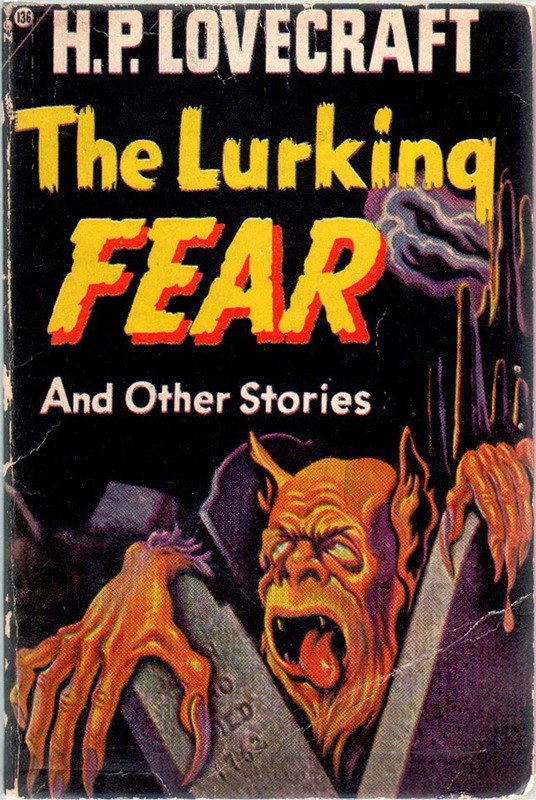 It makes me wonder whether this anthology played a big part in bringing these great stories to Hollywood's doorstep, as buried as they had been in old pulp magazines, were less likely to be seen and remembered. 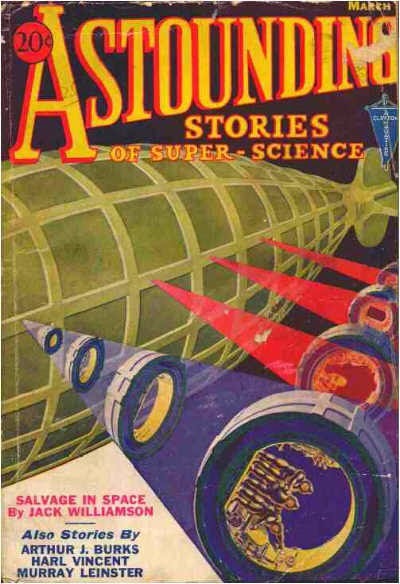 The anthology was conceived in 1944 and much credit for the high literary bar set goes to John W. Campbell, the writer/editor of Astounding Stories/Science Fiction who first published most of the stories. Campbell assumed the editorship in late 1937 and his tenure breached what is known as "the golden age of science fiction". 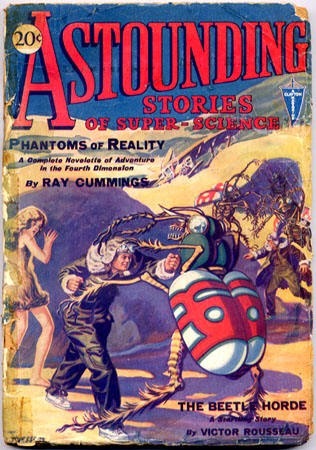 Astounding Stories debuted cover date Jan/30 under the editorship of author Harry Bates and published by Publishers Fiscal Corp, a sub-publisher of Clayton Magazines. 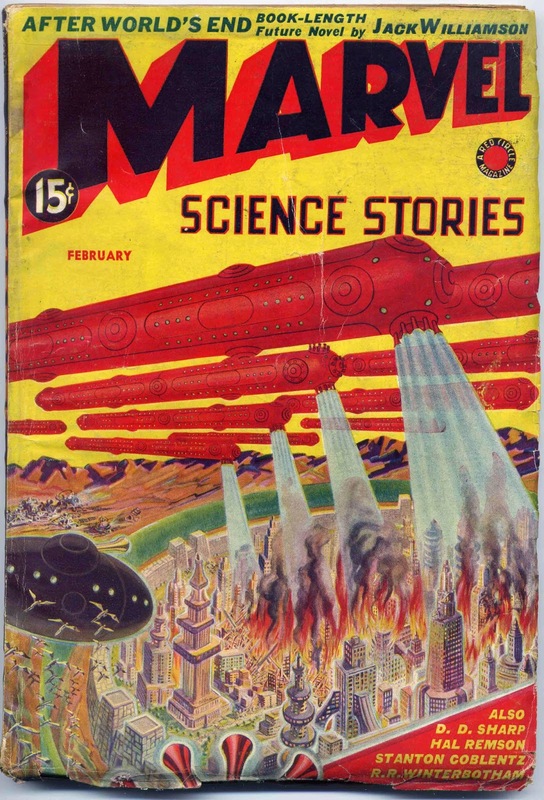 It was clearly influenced by Hugo Gernsback's Amazing Stories but was really only a knock-off, trending more towards pulp-ish fiction than harder science. 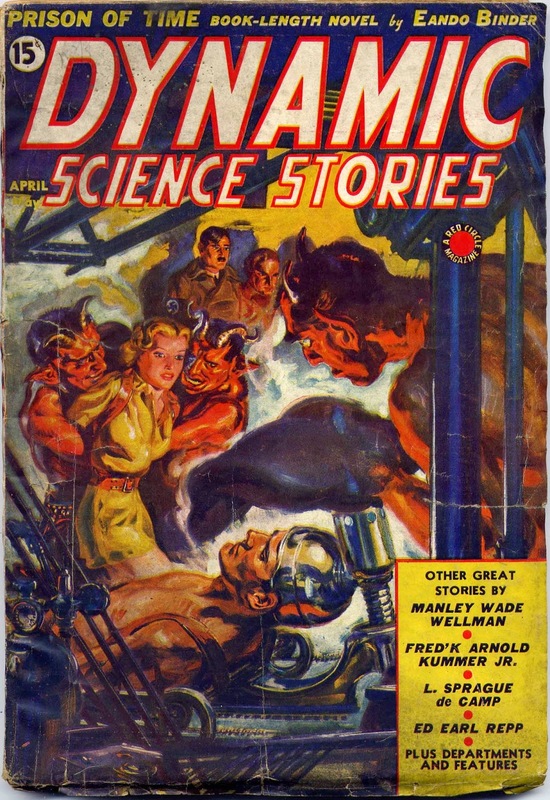 The first 34 issues, ended with Vol 12, #1 (Mar/33). 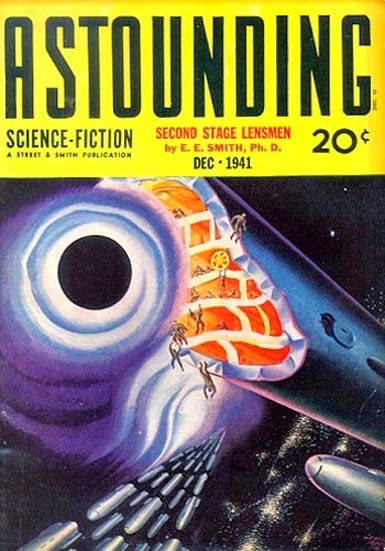 After a hiatus of 7 months the title was bought by Street & Smith and re-launched with Vol 12, #2 (Oct/33) and F. Orlin Tremaine as editor, ushering in a standard of fine literary fiction wrapped around elements of scientific speculation and innovation. These stories would become the gold standard for intelligent science fiction that would be continued in Dec/37 when John W. Campbell became editor (see letter from Campbell to Aug/47 Writer's Digest below), a tenure that would last until Dec/71. 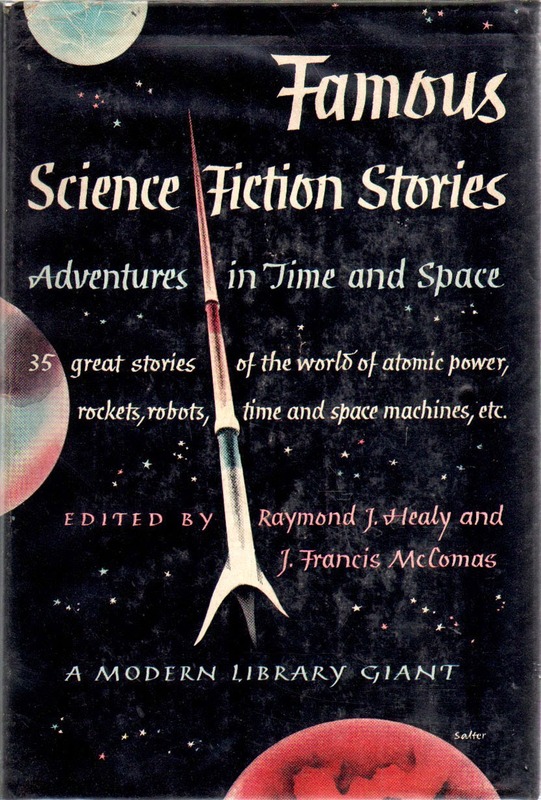 The title would change to Astounding Science Fiction in Mar/38 and to Analog Science Fiction/Fact in 1960, continuing to this day. 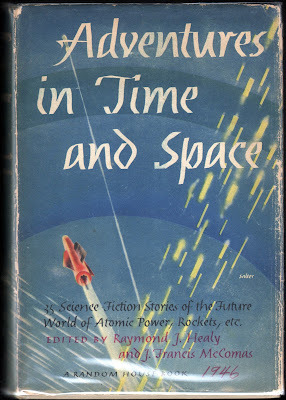 John W. Campbell's long editorship would shepherd the early careers of some of the giants of the genre, individuals whose influence will be long felt in science fiction. 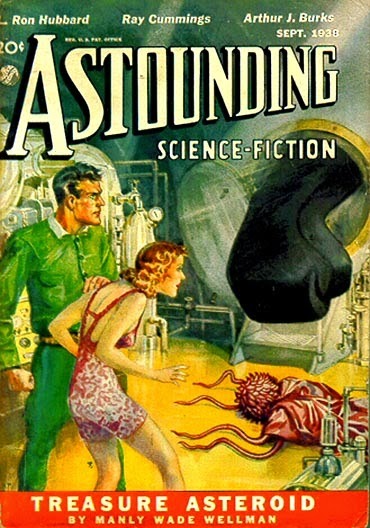 When Martin Goodman launched his science fiction pulp Marvel Science Stories Aug/38, he shakily modeled the editorial slant on Astounding Science Fiction, leaning the content towards intelligent harder science speculative fiction and even launching a letter page "Under the Lens" that was patterned after Astounding's "Brass Tacks". 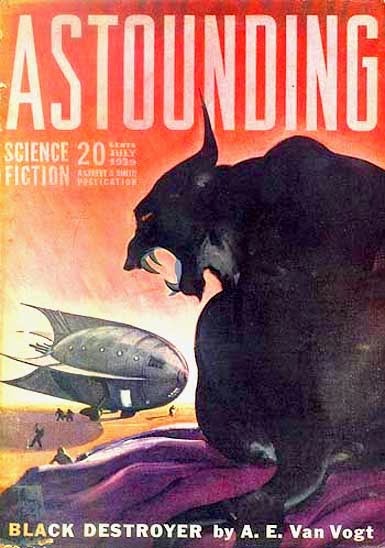 Unfortunately, after only five issues, Goodman's title reverted to a traditional pulp fantasy bordering on shudder-pulp content and readers lost a possible companion magazine, as science fiction held no special place in his eyes. Goodman would just as well cancel it as change it to another redundant western pulp. 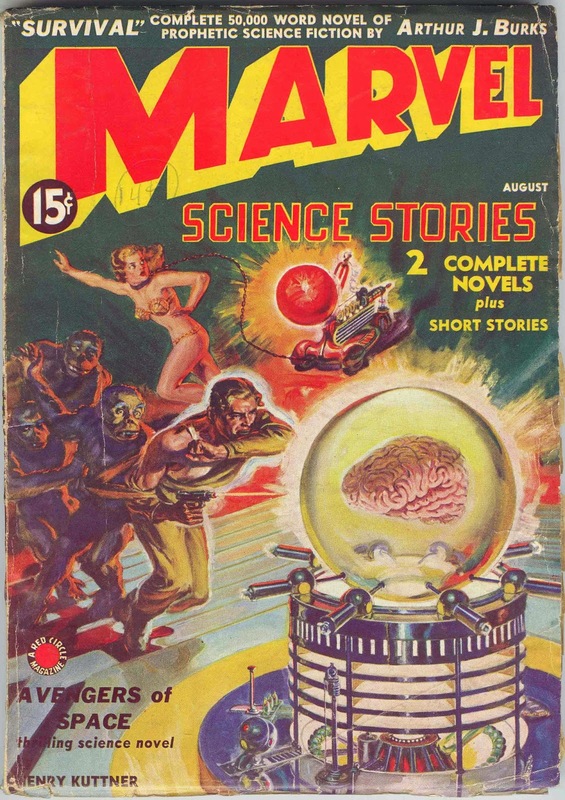 Goodman also cancelled Marvel's sister publication Dynamic Science Stories after only two issues at this same time of the content changeover. A sampling of Astounding Stories/Science Fiction, including first below the issue publishing one of my favorite stories of the Random House anthology, P. Schuyler Miller's "As Never Was", the greatest time travel paradox story of all time from the August, 1944 issue. 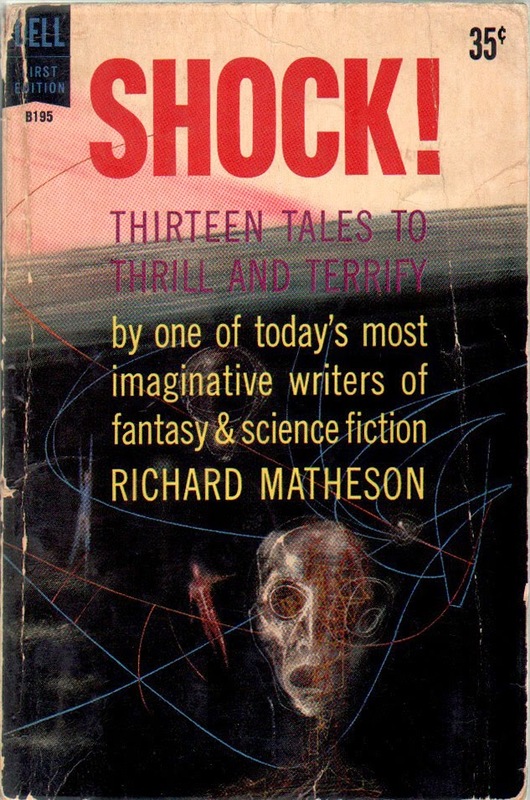 A second printing of this Random House volume came out in September 1946, which I believe was identical to the first. 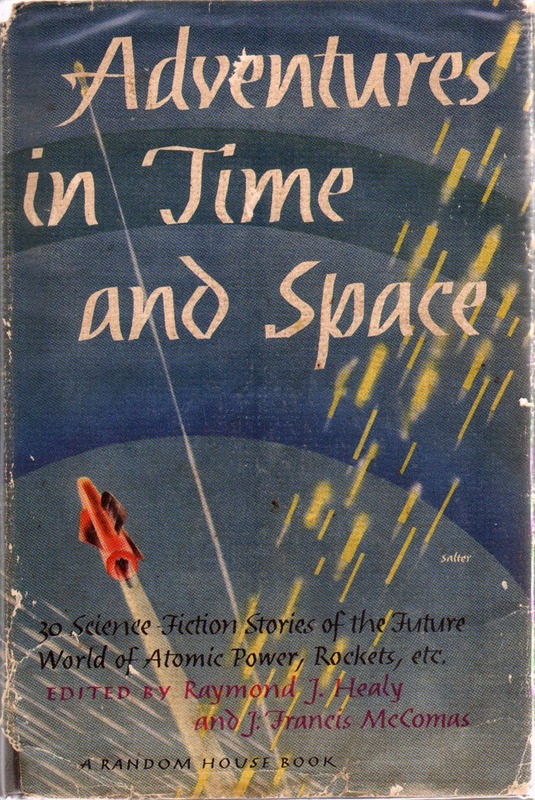 A third printing came out February 1947. 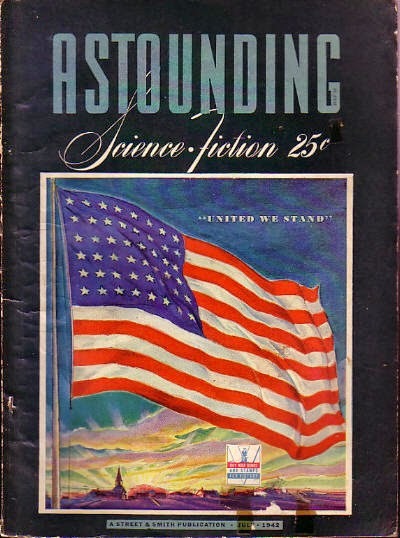 The fourth printing in August 1950 is slightly larger in size and physically thicker, but comes in at only 824 pages, editing out the final 5 stories listed above. The books is substantially thicker due to a better paper stock. 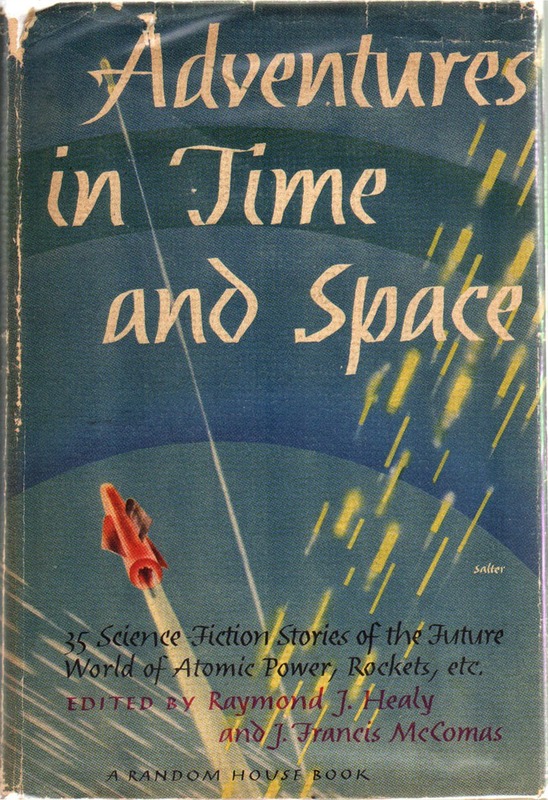 A 5th printing followed in August 1951 and a 6th printing in July 1952. 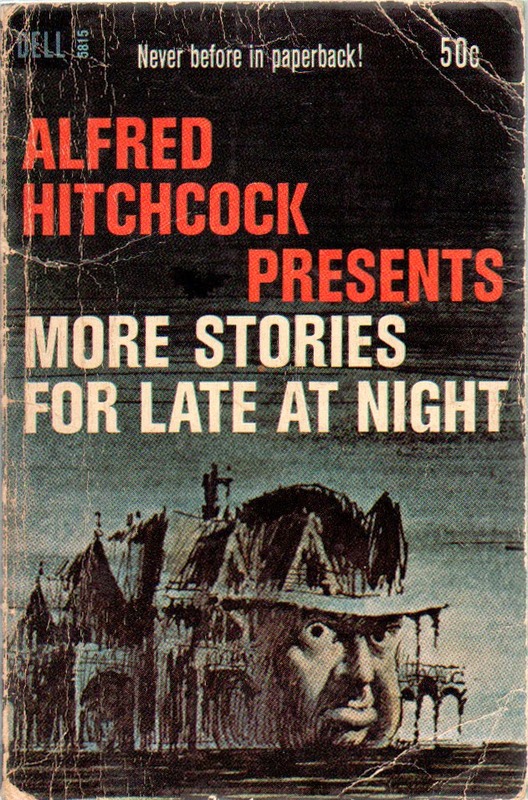 I don't know if the second and third printings featured 35 or the shorter 30 stories that the fourth contained.. 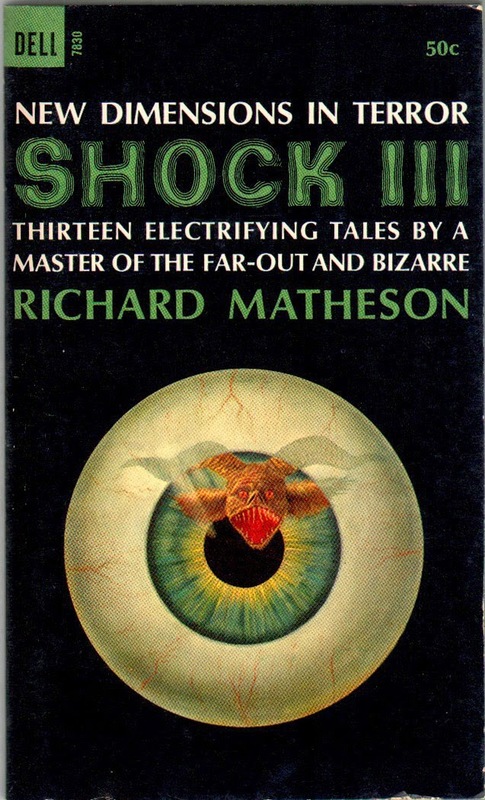 There was also an edition published in 1957 under Random House's Modern Library Giant series, #G-31. This volume has a different cover but reprints the original 35 stories once again, coming in again at over 1000 pages, including a new uncredited 6-page introduction detailing the history of the book's genesis. 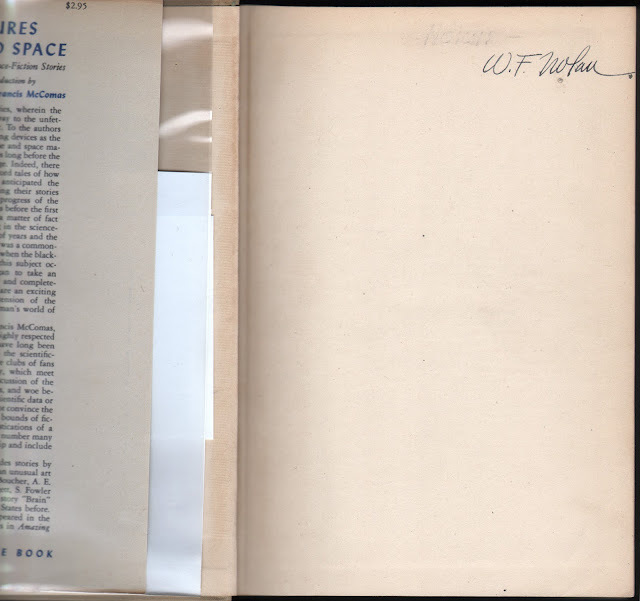 This edition went through a total of 9 printings up to October 1964. 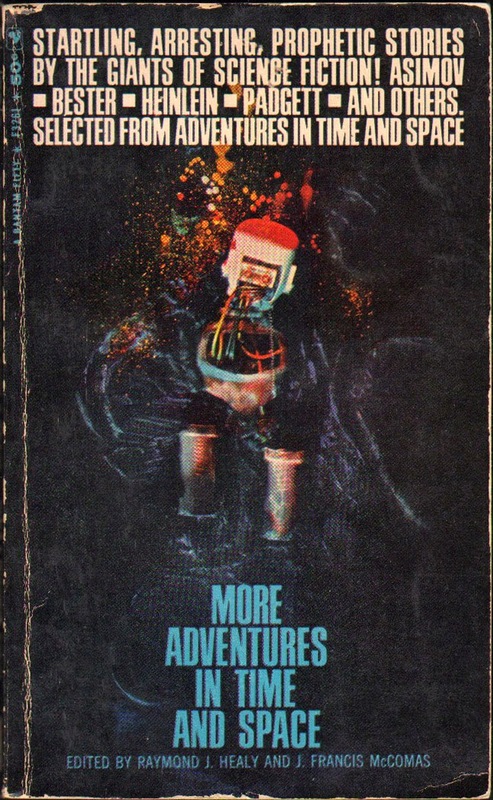 In 1975 Del Rey Books, the new science fiction imprint of Ballantine Books (and owned by Random House) released a softcover version of the original hardcover edition, clocking in at 997 pages, with all of the original 35 stories. The 1979 printing is below, with all 35 stories. In 1985 Random House Value Publishing released it again in hard cover, although I don't know what the entire contents are. In actuality, there may even be further permutations of this book that I've missed. If anyone knows of any, please let me know. I acquired most versions of the book in my quest to unravel its mystery to me. Somehow I even acquired William F. Nolan's copy of the book!!! Finally I felt I knew all that could be uncovered. 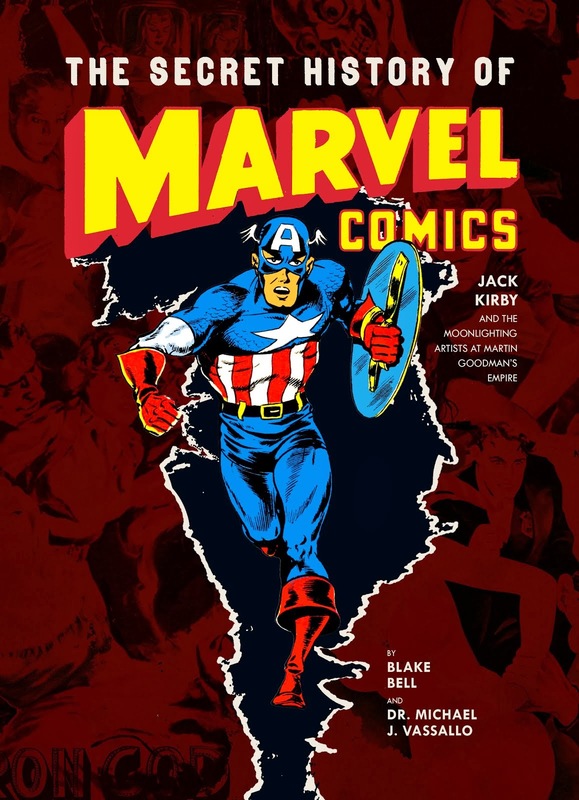 That was, until I dove into my research for The Secret History of Marvel Comics. As I pored through decades of Writer's Digest, I was surprised to come across several issues in 1946 where this book was referenced. 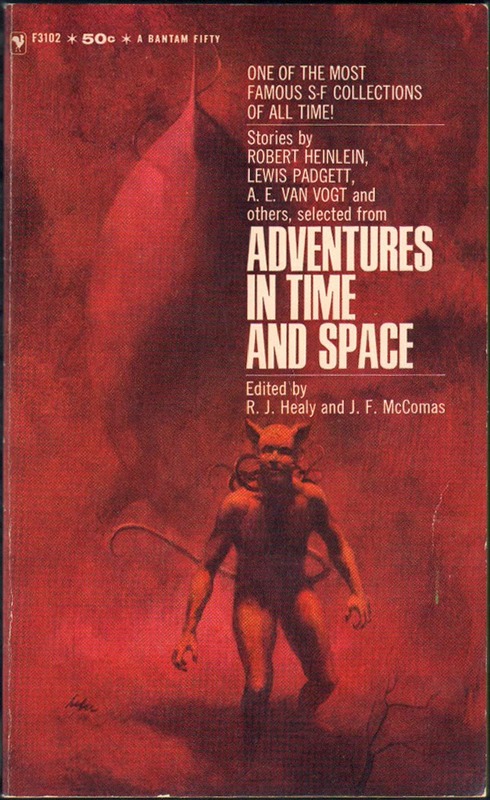 The first reference was from before the book was even published and I realized that this tome was actually one of the earliest hardcover anthology collections of science fiction stories in history by a "name" American book publisher. The references were in The Forum, the letter pages of the trade journal and centered around a discussion of royalty payments to the original pulp authors. For months prior to this the letter pages were filled with discussions of "writer's rights" (from an editorial article I do not have) and what policies various pulp houses had in enforcing these "rights" (example, first North American Serial Rights). 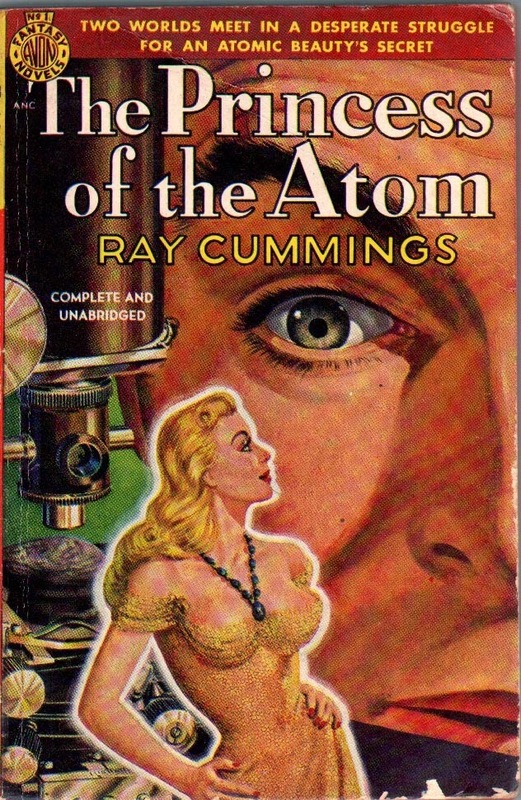 Pulp editors and authors all chimed in, including Ray Palmer of Ziff-Davis. The back-and-forth is fascinating, and showcased the types of debates that original creators/authors had been fighting with publishers for decades with respect to their just compensation in both the "first" publishing as well as the "reprint" rights as anthology publishing began to rise post-war. A window can also be seen into how the lowest tier of authors were treated, namely these authors in the pulp houses. I'm going to present these discussions in their original, unedited form. The original letter by author P. Schulyer Miller (referenced just below) I do not have, as it was sent by Miller to Bennett A. Cerf, President of Random House, and forwarded to Writer's Digest by Bennett (and I don't believe actually printed). 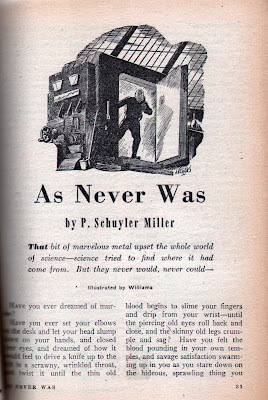 Miller had 2 stories reprinted in the volume, The Sands of Time and As Never Was. Note the “boys” are making dire predictions as to what’ll happen when the “reprinters” go back to business. Do they mean they are aiming to rook the writers as soon as the going gets tough? Nope, I’m not forgetting them days! I was one of the rooked writers. My dealing with writers seems to be strictly personal. The company has never changed its “policy” of buying all rights it can get. But it also has never changed its policy of sticking by the deals its editors make. So I guess the writer who deals with me can do it with confidence. As for these editors who so kindly warn me, let’s put it this way – which one of ‘em’s going to be the first to put out one of those reprints? Letter from Bennett A. Cerf, President, Random House, followed by a comment from Writer's Digest editor Richard K. Abbott. I am forwarding Mr. P. Schulyer Miller’s letter regarding payments for permission to use stories in our new science fiction anthology to Mr. Ray Healy, who is editor of the book and who made all the necessary arrangements therefor. You will hear very promptly from Mr. Healy in regard to this matter. I would like to say a word in general about our policy with regard to stories used in Random House and Modern Library anthologies. Having published many anthologies and having edited a goodly number into the bargain, my interest in this subject is as great probably as that of anybody in the business, and is most certainly my intention to see that the authors represented in these anthologies get their full share of the spoils. I do not think that it is possible to make any hard and fast rule that will govern anthology payments. For example, an editor who comes to a publisher with an ingenious anthology idea is certainly entitled to more than one who accepts a specified job that originated in the publisher’s mind. Furthermore, the question of possible profit must be considered. If it’s a whopping big anthology to be sold at bargain price, the profit margin obviously is small and the editor or publisher can’t possibly pay as much for his material as he can on a smaller volume aimed at the higher priced market. Until recently it was almost the universal rule, as you know, for editors to buy anthology material outright. The price paid for such material has risen steadily in the past several years and in many instances authors have gotten $50 or more for the use of a story that has already been used in a dozen other collections. This raises another point: does a story that is being anthologized for the first time deserve a higher payment than one that has become hackneyed through endless repetition? The idea of cutting original authors into royalties on anthologies is comparatively new. In general, I consider it the fairest basis for operation. If the anthology is the editor’s own idea, I think the said editor is entitled to 50 percent of the regular royalty rate, with the other 50 percent being divided on a pro rata basis among the authors included. If the publisher gets the idea, I think the editor should get a maximum of 25 percent reserved for division among the authors. To sum up, I don’t think the time has arrived yet when the publisher can make a hard and fast rule that will govern all the anthologies on his list. The special considerations simply must be taken into account. On the whole, I think publishers in America are fully aware of their responsibilities in this anthology question and are sincerely interested in being fair to everybody concerned. Incidentally, I’d like to say in conclusion that in my opinion this whole anthology business hs been overdone to an almost ludicrous degree. I think it will be a fine thing for the whole publishing business is a moratorium on all new anthologies is declared for the next five years. RANDOM HOUSE is bringing out an anthology of science fiction and several of our readers who are included in it want to know about payment. 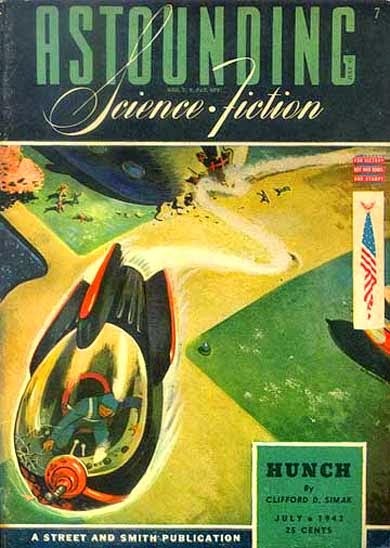 In some cases, the science fiction story was published first by pulp houses who owned all rights. Should RANDOM HOUSE pay the pulp publisher a fee and let it up to the pulp paper to retain the entire amount, or should RANDOM HOUSE go out of their way to see that the author gets his payment even if the pulp house holds on to it? We don’t know what any other book publisher would do, but RANDOM HOUSE, on the basis of its past, will do the big thing. It’s just another point showing how the pulp publisher who buys all rights can, IF HE WANTS TO, play hell with the writer. –Editor. 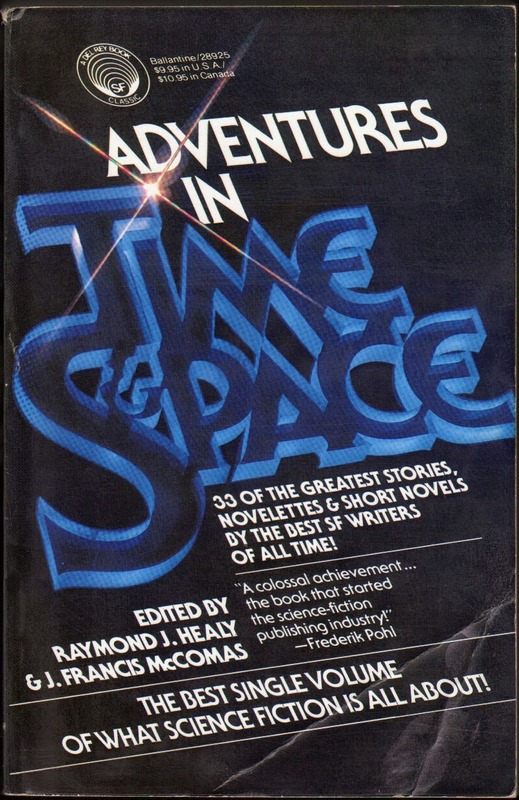 Letter from Raymond J. Healy, co-editor of Adventures In Time And Space, followed by a comment from Writer's Digest editor Richard K. Abbott. Bennett Cerf forwarded your letter about the matter of pulp authors’ rights in the anthology field; also a copy of your article in the October 1945 Digest concerning rights in general. 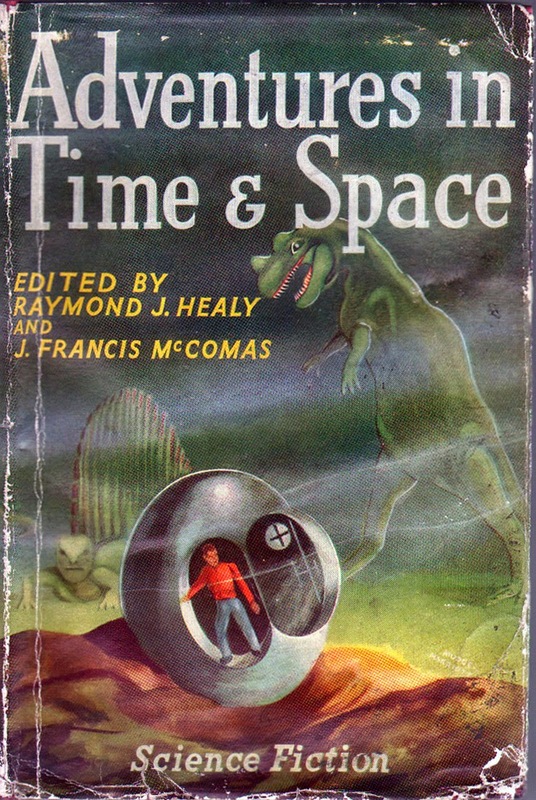 The idea for a Science-Fiction anthology was original with me and, along with my associate, J. Francis McComas who has had pulp stuff published under the pen name of Webb Marlowe, I spent over two years plowing through fifteen years’ issues of the various magazines in the field. We accepted the usual anthology contract from Random House and agreed to complicate our task as editors further by handling and acquiring the necessary permissions. This is a routine way of doing things amongst anthologists. But it is a complicated, difficult and laborious task as anyone with experience in the field will agree. We wrote letters, sent cables and telegrams, interviewed writers personally and spent so much time and money in the process that our book will have to do very well indeed to compensate us properly for the efforts expended. We agreed to pay Street and Smith a half cent a word for the stories they control and offered the same rate to writers who had control of their own material. A fifty percent cut over the original sum the writers received for their stories is certainly not unfair – it might very well mean more that they should receive had they accepted a royalty agreement – but that is, of course, purely speculative. Actually, the idea of royalty did not occur to us before seeking permissions although since the completion of our collection we have talked with a number of prominent writers about just that subject. Among those staunchly supporting this “share the wealth” (if any) campaign were Anthony Boucher, Cleve Cartmill, A.E. 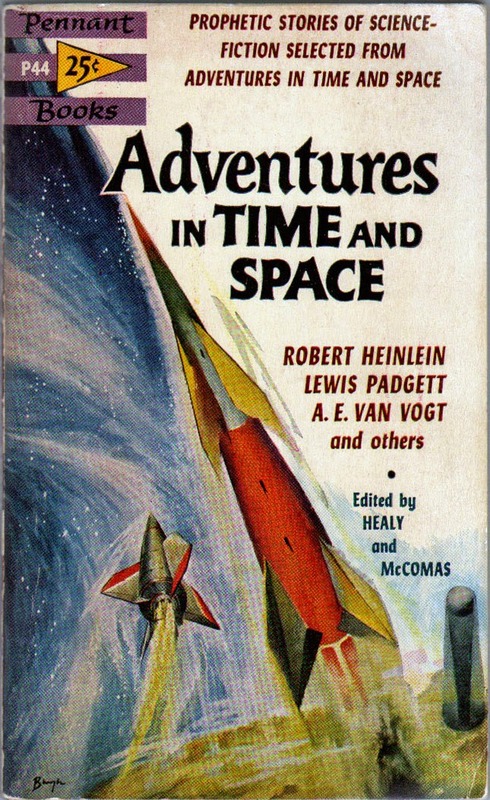 Van Voght, Craig Rice, Robert A. Heinlein, and a number of other top-notch boys not necessarily familiar to or with the pulp field, such as Frank Fenton, Jo Pagano, John Fantey Bezerides, all novelists who have no such problems about reprint rights. These latter fellows heatedly discussed still another problem of writers failing to share in a just apportionment of the income their works provide and that is the income circulating libraries enjoy from their books. Take for example, a good but not too successful mystery novelist. A bookstore will pay anywhere from a dollar twenty to a dollar fifty for his new book. It is usually placed in the rental library where it may not even pay for itself but where again it may earn as much as five dollars for the bookseller. The author has received perhaps a quarter as a royalty from the publisher. Where is the equity? But to get back to our mutton: Mr. Ralston at Street and Smith did at one time in our negotiations suggest that we offer a regular book royalty contract so that the authors might benefit more fully from the publication of our book. 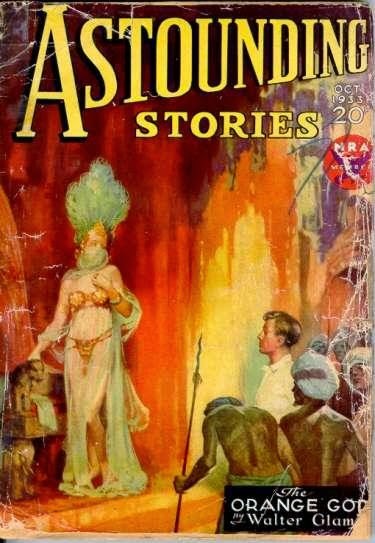 It seemed to McComas and myself that if our collection did make any money for Random House, who were gambling heavily in contracting to reprint a quarter of a million words or so in a field that until that time had been successful commercially only in the pulps, it would be fine. But we could not see saddling them with an almost impossible job of bookkeeping and what is more – and perhaps more to the point – we were anxious to make a few dollars for ourselves for the long and difficult job of culling we had undertaken. We followed what we assumed to be a fair practice inasmuch as we agreed to pay the first permission rate quoted to us. It was also our understanding that Street and Smith intended to turn over the fees, or a goodly share thereof, that they received from us to the authors whose stories we requested to reprint. P. Schuyler Miller seems like a nice and progressive fellow, but he is wrong in suggesting that editors contact writers directly at first. Before that can be done, publishers will have to change the copyright clauses that appear in all books and magazines. We secured permission to reprint his second story from Street and Smith who owns the rights to it and presume they will reimburse him for it because of the attitude shown in our correspondence with them, referred to above. Mr. Ralston, although heartily favoring a royalty contract for his writers, agreed to the half cent a word arrangement originally suggested because he was broad-minded enough to admit that the book, although perhaps more profitable for the authors included, were they to receive royalties, might very well be unprofitable to the editors and publishers. Under the present arrangement, the book will see the light of print, the authors will be widely publicized under the imprint of a distinguished, top-flight book publisher, and I think that except for theory, everyone will be happy. I have had letters from a number of writers included in our anthology – it is to be called “Adventure in Time and Space” incidentally – who were absolutely delighted with the rate we were offering for stories they had forgotten for years. I really don’t think McComas and I have been villains or even mildly greedy. We embarked on our venture to make a few dollars for ourselves and still hope we may. We are inclined to agree with Mr. Cerf that the whole anthology field has been overplayed of late and in the future will probably let somebody else worry over the ethics involved in the compilation of such properties. What this whole thing boils down to is this: Random House is owned and run by square shooting people. Over a period of years, free-lance writers are far better off because Random House exists than they would be if there were no Random House; and so is American literature. On a specific deal like this one, it seems to us though the free-lance writer who sold a stf story for $40 and receives a $20 bonus because it is reprinted in an anthology can’t buy much bread on that kind of business. We would have suggested, on this kind of book which plumbs ground hitherto 100% ignored, that a flat check of $50 would have been The Thing To Do because it would set a higher standard for the next fellow and anything that makes it tougher for the next publisher makes it better for high caliber firms like Random House. We agree that if Random House had paid $50 flat for each story it would have been the sort of unselfish act one is always asking the other fellow to do. In addition, Random House does its share of these things, we learn from our readers. Editor Healy didn’t do the far reaching Big Thing, but he did the commercial fair thing. – Editor. "The trend of the month has been toward much enlarged quarters – buy or build – by all types of publishers to allow for their enlarged production plans. This has involved purchase of entire office buildings by several publishers, as Random House recently bought the elaborate house back of St. Patrick’s Cathedral at 457 Madison Avenue. Their move from 57th Street is due about May first." In effect, Street & Smith acted as authors’ agent, without collecting the usual 10% … although they will collect good will and a certain amount of publicity. Moreover, S&S brought more brains to bear on the deal than could be expected from most authors; the book rights to these stories revert back to S&S after six months, when they may be bought again. Whatever the inequities of the situation may be, S&S deserves a round of applause for the way they handled their end. Of course, we would prefer that S&S turn over all rights to us battened-upon-the-brain-squeezers, but that’s another long (and so-o-o weary!) story. As for the suggestion of a flat $50 rate – whoa! – back up! Some of these anthologized yarns run 20,000 words! Let’s keep it as to word-length, huh? –unless someone can (as I prefer) produce an equitable method of distributing royalties which will allow the authors to gamble on the success of the books. In answer to a query from your reader, of course we would pay for any of the pulp paper stories from the Popular chain. Should the editors wish to reprint them in our new Story Digest. The authors would be paid at the same rate as though their stories had been published in any magazine outside of Popular Publications. I am sending you a bomb under separate cover for even inferring that we might undertake such an underhanded practice as to pay less for stories reprinted from our own magazines. The entire selection of material for Story Digest is made by the editors, but they will be very glad at all times to have suggestions from authors as to stories they might like to see included. 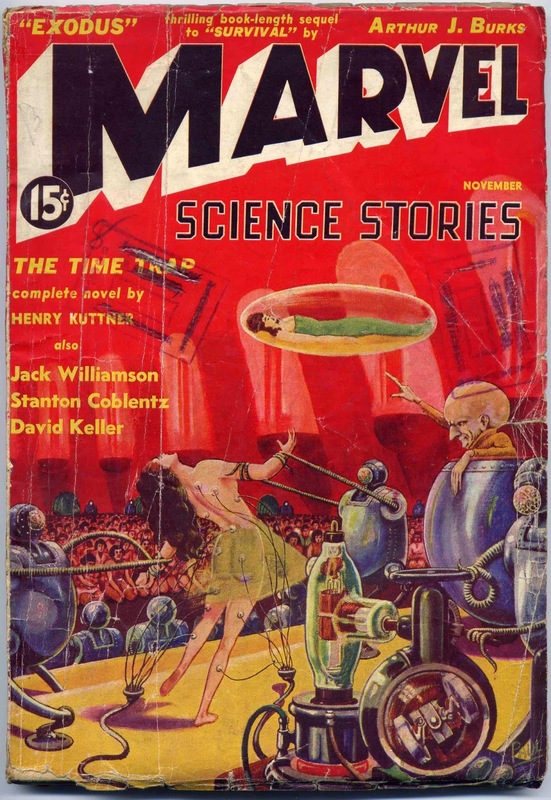 Payment is at the rate of $75 for stories taken from pulp paper magazines, and $75, $100 and $150 for stories from all other publications, depending upon length. Payment is on acceptance. At the present time we are not using any original material. 205 East 42nd Street, New York 17. Having, as yet, had no evidence that my subscription is again active, other than the highly entertaining little manual on how not to plot, I picked up the May Digest on a newsstand and was at once confronted by Bennett Cerf’s comment on my letter, with regard to Random House’s science-fiction anthology and the “all rights” situation. May I emphasize that I have no quarrel at all with Mr. Cerf, for whom I have the utmost respect as a publisher and columnist – and I have no evidence that I have any reason to quarrel with the editors of the anthology in question, Messers Healy and McComas. If the terms they offered for the one story on which I do own book rights – ½c a word flat payment – hadn’t been satisfactory, I could always have tried to dicker or refused outright to assign permission to use the story. I was trying to bring out the completely screwy complications of ethics (if you want to call it that) which arise from the policy of pulp publishers of buying all rights. Three stories of mine, published by the same publisher over the last nine years, are chosen for two anthologies. For one (one which the publisher had bought “all serial rights”) I will be paid on the terms agreed upon with Mr. Healy. For a second in the same anthology, Street & Smith will be paid (presumably at the same rate, unless they struck a better bargain). For the third, Street & Smith have willingly reassigned clothbound book rights, without asking for any share of the payment. Same publisher, same author, and in two of the three cases, same anthology. It’s the formula that is to blame, not what happens when you use it. 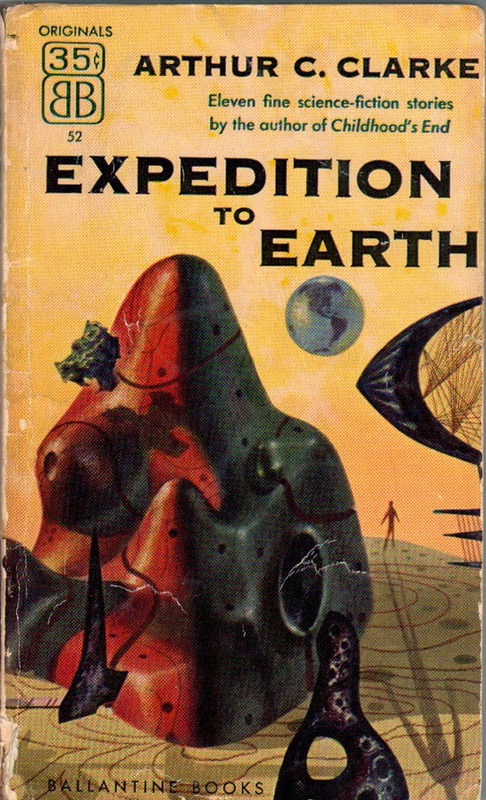 Street & Smith assigned book rights to the third story to me because the editor of the collection in which it will be used, August Derleth, happened to know where I am and asked me to ask for assignment. Whether he does that in every case I don’t know, but I would not be surprised to find that he does, because he knows the fantasy field and its writers, inside out and is in a position to write directly to the people whose work he wants to use. Healy and McComas, I should imagine, are in a very different position – more or less, novices in the field, having decided what stories they want and taking the most direct way to get them. If I had had their idea first, and had done anything about it, I would probably have done what they seem to have done – namely written to the original publisher of each story to find out who owns book rights. 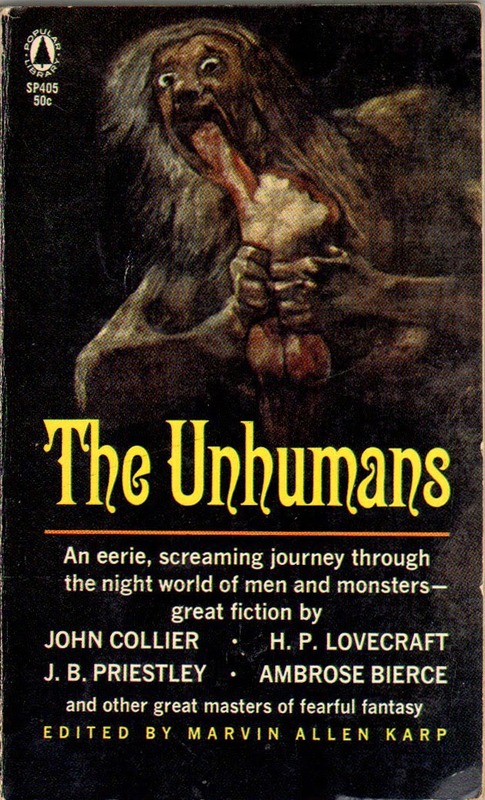 It might have taken months to run down each individual author, without the inside track a man like Derleth has. Street & Smith happened to own rights to one of the two Miller yarns they wanted – so S&S sold them. They didn’t own book rights to the other, so Healy was referred to me. All straightforward. I like Mr. Cerf’s idea of a pro-rated royalty, and have an article anthologized on that basis. If sales are small, this plan may bring the author less than an outright sale to the editor. Actually, much of the inequity in the situation would be alleviated if magazine publishers who buy “all rights” will, after some lapse of time which seems reasonable, automatically reassign book and other rights to the authors – or if they will give an author a blanket assignment of such rights to all his stories they may have published*. Then anyone with hope or faith in sales possibilities can set out to do something about book publication, or radio or film use. As it is, such rights are assigned to the author only for a definite purpose – not on contingency. To answer the questions you raise in your own comment on Mr. Cerf’s letter: I really doubt any publisher, or even the average editor, can afford to go out of his way to insist that the author and not not the pulp publisher is paid for book rights to an anthologized short story. Novels are another matter. And your last sentence sums the whole substance of both my letters. This July issue also sports a 10 page article on the general topic of “Your Book Reprint Rights” by Harriet A. Bradfield. Included are all the available markets including the rise of the burgeoning paperback reprint houses, book-digest reprint lines, magazines with book features and the syndicates. For the first time in cheap newsstand publishing, the inequity of the topic of "reprints" is finally being addressed. The primary comment I can make from the writer's point of view is that to date we have not bought any story whatsoever from anyone who has not read the magazine. 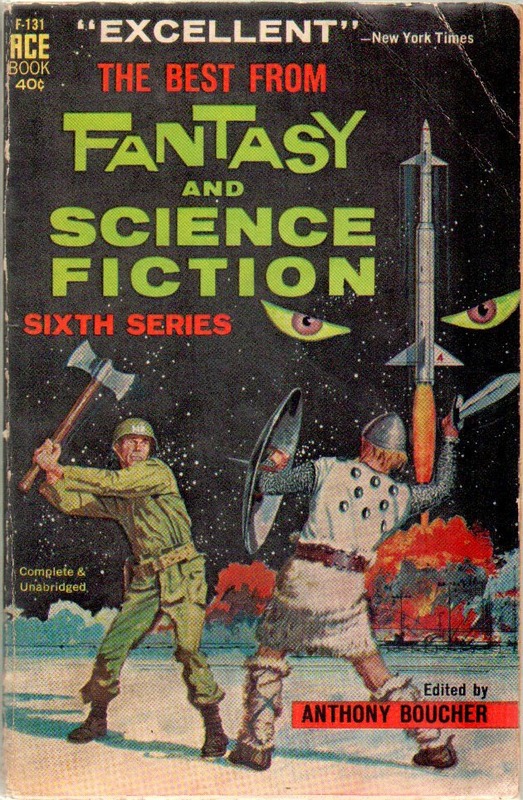 Science Fiction is a specialist's field. 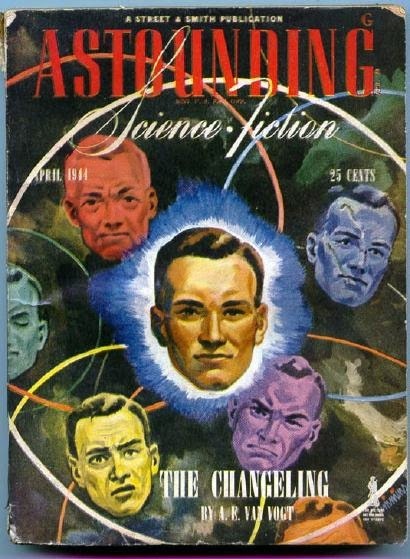 Within that field Astounding Science Fiction is a specialized magazine. Unless the would be author understands the philosophy of science fiction and the basic editorial concept of Astounding, his chance of making a sale is about as remote as his chance of flipping a coin and have it stand on edge. Possible but not probable. 122 East 42nd Street, New York 17, N.Y.
My parents retired 20 years ago and moved their residence out of Queens, New York up into the Adirondacks, in the northern part of Lake George. In January of 2007 they received a phone call from the next door neighbor of Nick Nack. He had passed away at the age of 87 on the 17th and previously left instructions for the neighbor to contact my father for him to avail himself of all Nick Nack's worldly goods, as he had no real family to speak of. I drove down to Forest Hills for my father and all I retrieved were his music albums and books, packing up hundreds of jazz records from the 1940's through 1960's and a score of vintage film books, all loaded in crates. I also took an old yellow manila folder I found stuck between the albums. As I left, I took a photo of his door, knowing the name plate would shortly be removed and no further evidence of Nick Nack ever having lived there for over 40 years would exist, the man who was a disembodied voice on the phone with my father for most of my entire life from age 5 to 50. When I got home that night I left everything in my garage except for the books and the envelope. I dusted off the books, paging through coffee table books about the great film studios and jazz personalities, interestingly coming across annotated copies of Hollywood Babylon and Jazz Anecdotes where whole paragraphs were underlined, highlighted or cross-out in pencil with the words "wrong" or "didn't happen that way" written in the margins, including the frequent phrase "I was there that night ... not true". 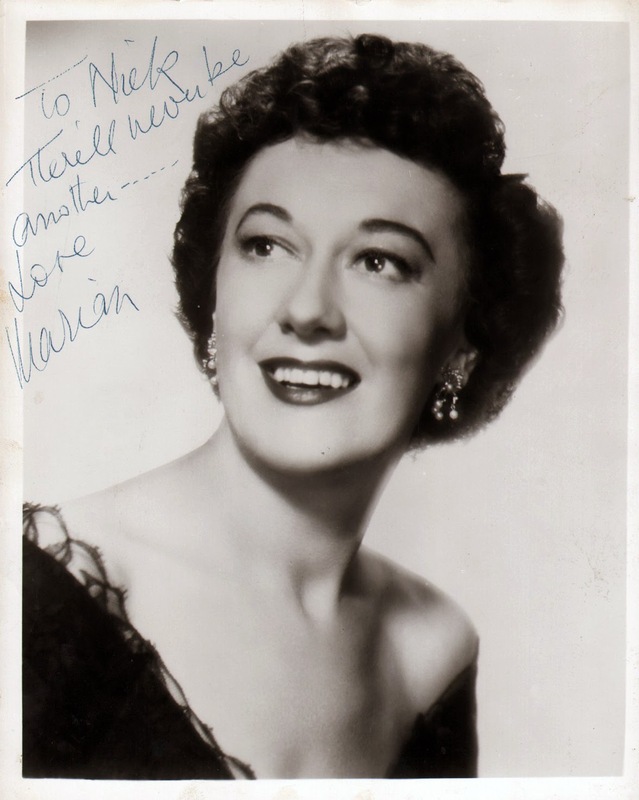 I also opened the envelope, finding a stash of vintage studio publicity photos of jazz musicians, all autographed to Nick Nack. 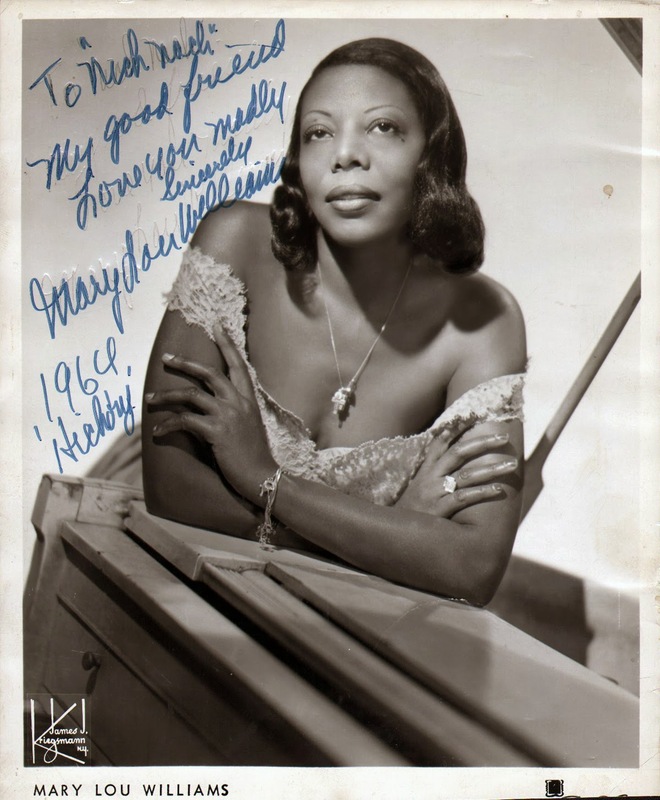 On the top of the pile were vintage autographed photos of jazz greats Bill Evans, Billy Taylor, Mary Lou Williams and Marion McPartland. At the bottom of the pile was a signed publicity photo of my father! I wonder if Nick Nack ever wanted that book back. 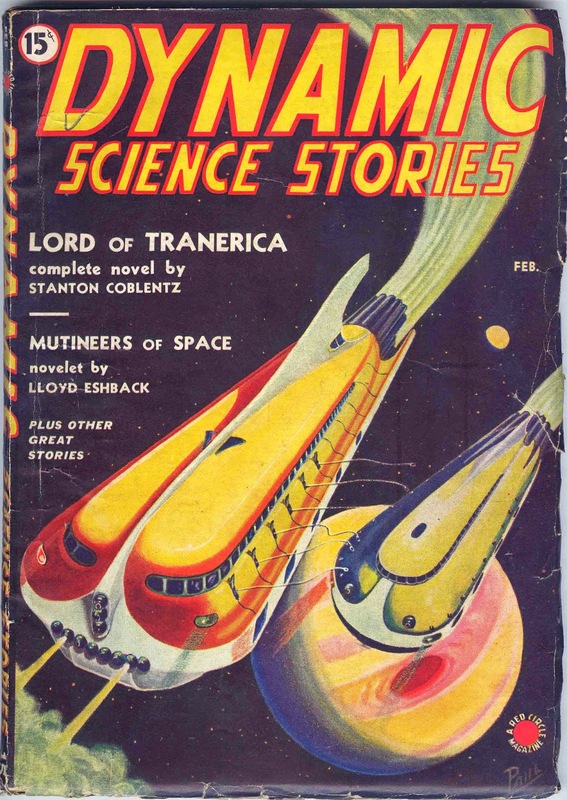 a wonderful mix of science fiction history, pulp history and personal history. Fascinating stuff! 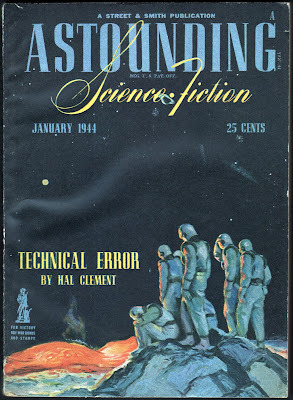 It wasn't the first hc sf antho from a non-specialty publisher, but it was an early one. 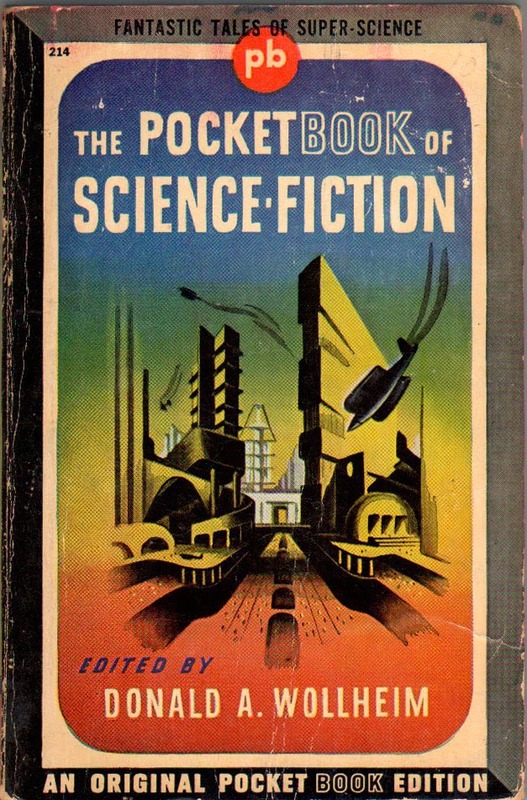 It was preceded by the likes of Donald Wollheim's THE PORTABLE NOVELS OF SCIENCE from Viking Press, Groff Conklin's THE BEST OF SCIENCE FICTION (Crown) and, perhaps more arguably (since not "purely" an sf volume and from the smaller publisher Funk, as in Funk and Wagnalls ex-honcho's later house) THE OTHER WORLDS. 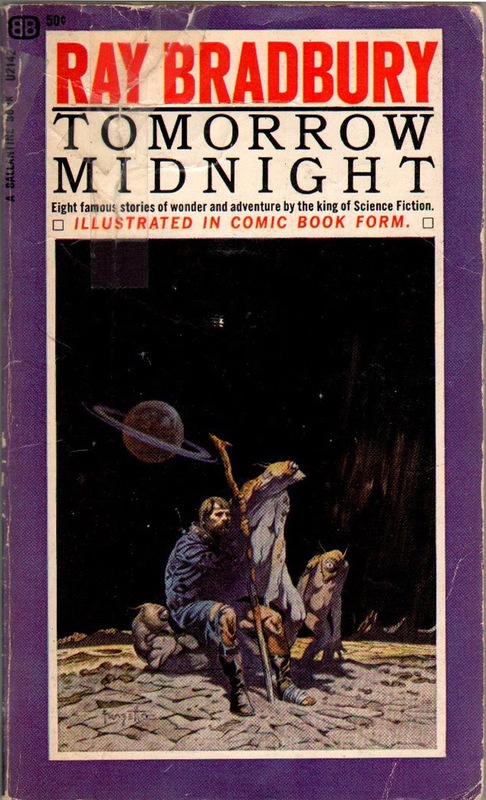 It's also not the best one, but it is the best-remembered, and was certainly the longest in print--knocking around the Modern Library and Del Rey Books didn't hurt there. THE OTHER WORLDS was edited by Phil Stong, btw. Thanks for the info on the earlier anthologies, Todd! Wonderful memories. I am sending the link out to my Usual Suspects, various SF news blogs and others around the world! Michael, thank you for that great link. I'll try to incorporate the data into the post in the future when I have time. It seems I had many of the editions referenced. 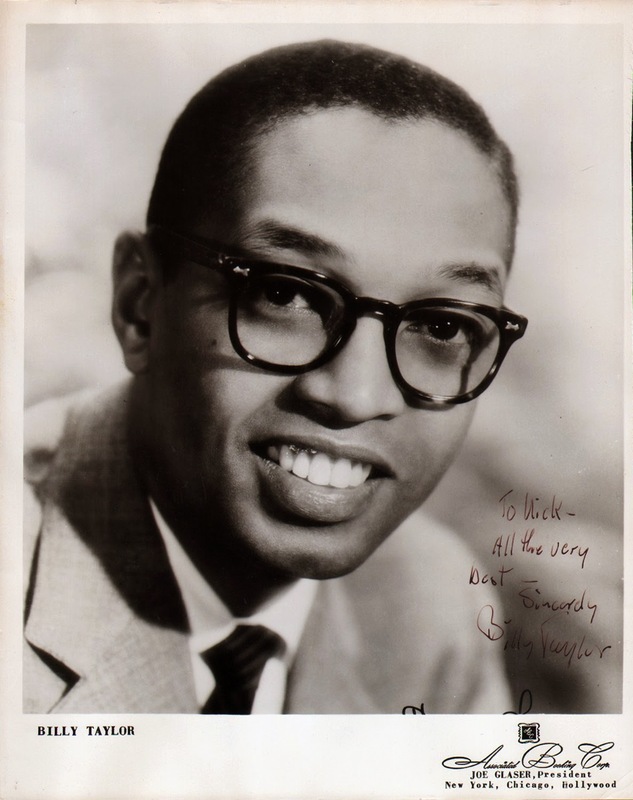 Todd, my brother saw Billy Taylor at a concert in Minneapolis in the 1990's. 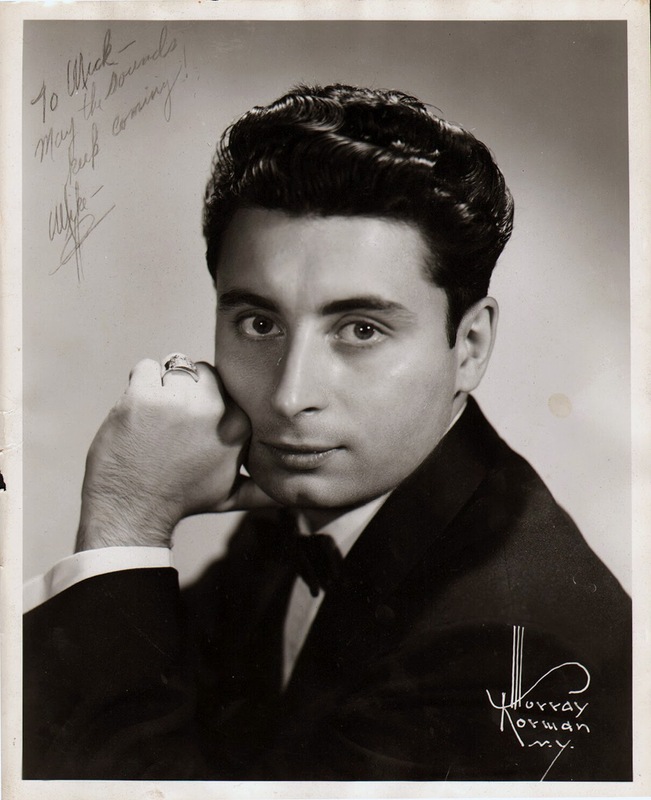 He waited after the show backstage to send greetings from my father, who was certain wouldn't be remembered from the Hickory House back in about 1960. 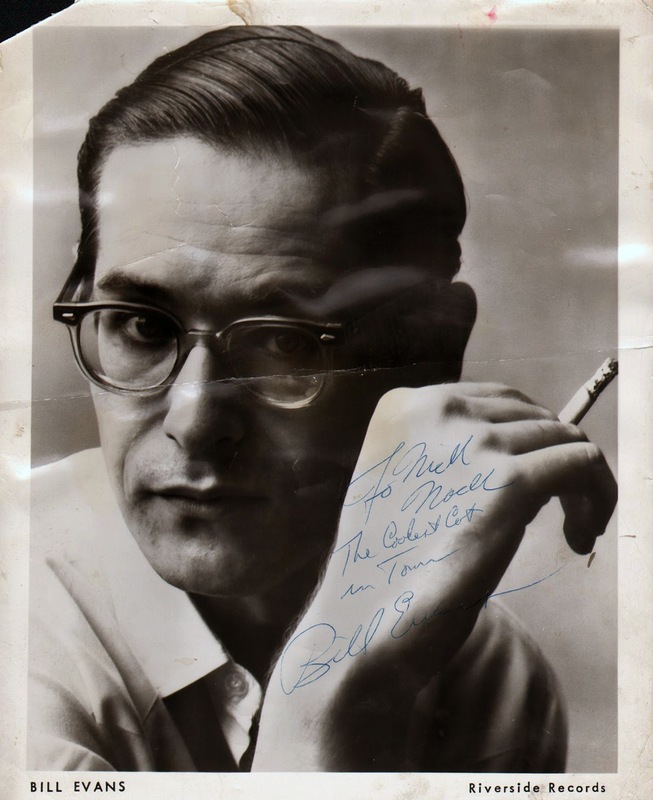 Well Billy did remember my dad, telling my brother that he was a pretty good young jazz pianist, and wondering what ever became of him. (My dad left that world to write and teach music for the next 40 years). But the biggest surprise my brother got was when he asked Mr. Taylor whether he remembered Nick Nack! Billy's eyes lit up and he replied "Nick Naaack!! I remember him!! Recalling that he was a real jazz character back in the old days who was at every venue in the city. A little Too much ASTOUNDING in the anthology (with only one story each from AMAZING and PLANET and the silly article from UNKNOWN) is one of the lesser weaknesses of the volume! Thanks for that link, Todd. I'll try to incorporate the data into the original post when I have the time. And, fwiw, there have been two atrocious film adaptations of "Nightfall"...whatever one might object to in the various adaptations of "Who Goes There?" is as nothing compared to the terrible things done to the story that helped bring Asimov to the attention of readers...too many of whom, as Asimov noted in his memoirs, would blithely come up to him in later years and tell him how "Nightfall," a rather gimmicky story from the first several years of his career, was the best thing he ever wrote.